Nesscliffe Country Park lies just off the A5 between Oswestry and Shrewsbury. The Old Three Pigeons Inn, dated back tothe 1400s, is located at the entrance to the Park and was said to be the watering hole of Humphrey Kynaston. Inside, the seat from Kynaston's cave is now part of the Inn's fireplace. 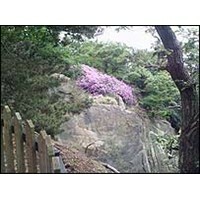 The park itself is divided into three areas, Nesscliffe Hill, Hopton Hill and the Cliffe. Shruggs Common believes to be the smallest common in Shropshire of approximately 1/4 acre, is found on Nesscliffe Hill. Visitors have an area of mixed woodland and heathland about the size of 140 football pitches to explore. Within the site there is an iron age hill fort, a series of impressive quarries which supplied stone for some of Shropshire's' castles and churches, and a cave hewn into the sandstone, which is said to have been the hideout of the medieval outlaw Humphrey Kynaston. 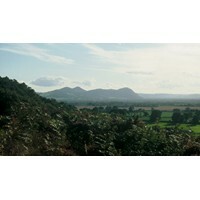 Nesscliffe Hill and the Cliffe covers two wooded hills and part of a heather covered ridge, and gives expansive views over the Shropshire countryside and Welsh hills. Waymarked circular routes provide easy off-road cycling and horse riding as well as walking. Some easy, reasonably level walking from Pine car park. Long walks over mixed terrain. Stout footwear recommended for this as some paths can be very muddy. 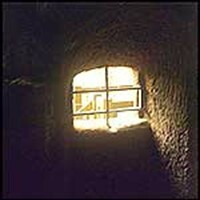 The Nesscliffe Rock Cave is part of the Nesscliffe Country Park. It is a small sandstone cave and is better known as Kynaston's Cave as it is the place he and his trusty steed Beelzebub sought refuge. 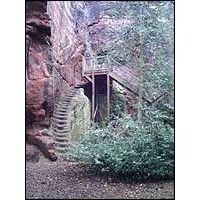 The entrance to the cave is six metres high and stairs were cut into the soft rock, however over time the stairs have eroded so a wooden staircase was built to enable access to the cave. Inside the cave you can see two chambers approximately four square metres big and the date 1564 carved in to one of the walls, followed by the initials of H.K. Humphrey Kyanaston. 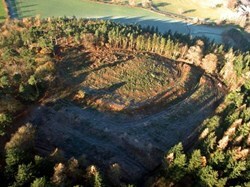 Nesscliffe Hillfort, a Scheduled Ancient Monument, was clear-felled earlier in the year. This was necessary as a blow out on the prevailing wind side of the hillfort threatened to bring the trees down like dominoes. Once the leading edge trees go those behind, which are weaker, tend to fall as well. Because the soil is very thin up there, the tree root plates were lifting and causing damage to the hillfort. Nothing is ever simple however, and now that the trees are removed, we now need to tackle the spread of bracken, which would completely obscure this impressive hillfort. 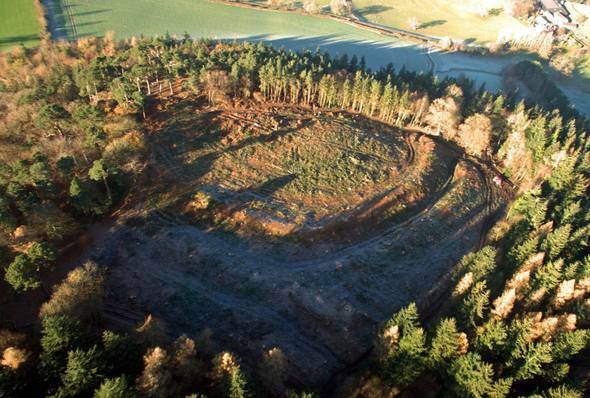 This aerial photo taken shortly after the clear fell is probably one of the few times in the last 2000 years that this hillfort has been viewed from the air and gives a real sense of the size of the place.